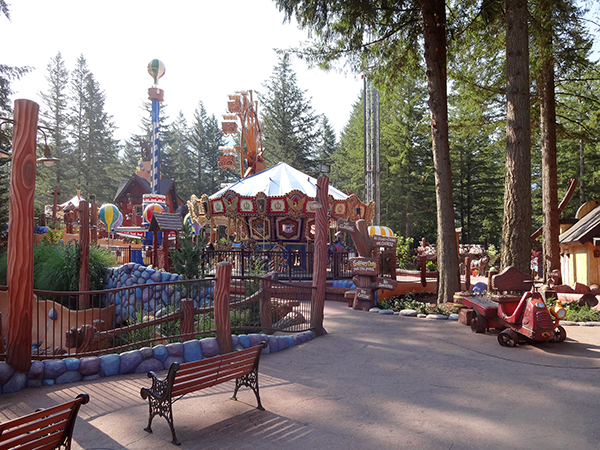 Here's a few more pictures of the completed Cultus Lake Adventure Park. We visited briefly today and it continues to be busy with lots of smiling faces. One of our many challenges in designing the park was to integrate it into the existing Giggle Ridge Adventure Golf. It works very well and guests (especially young ones) who pay golf can't wait to go to the new park when they are done and sample some of the rides they can clearly see while they play golf. The plantings sure dress up the work we did and make the park a very enjoyable and relaxing place. The Wilderness Adventure area is a whole world, separated from the park by elevation as it is set into a wonderful valley. I take my pictures when the park is not yet open but usually this area is bustling with lots of very active and happy kids. This is one of my favorite views in the park, taken from a tunnel looking South towards the Trading Post. And here's a shot taken from the opposite side looking North. This is the park at rest, with most of the shots taken before the park opens. It's fun to relax and walk through when all is quiet and still. I can't ever walk through without a grin on my face. This next photo sums things up nicely.